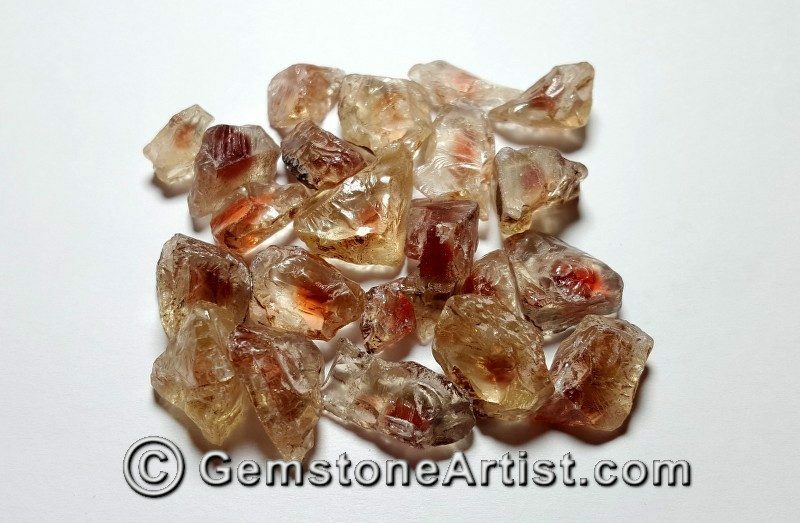 Learn to facet precious gemstones! The 2017 report took longer than usual to complete, partly because we’re also reporting on our experience of doing the show. 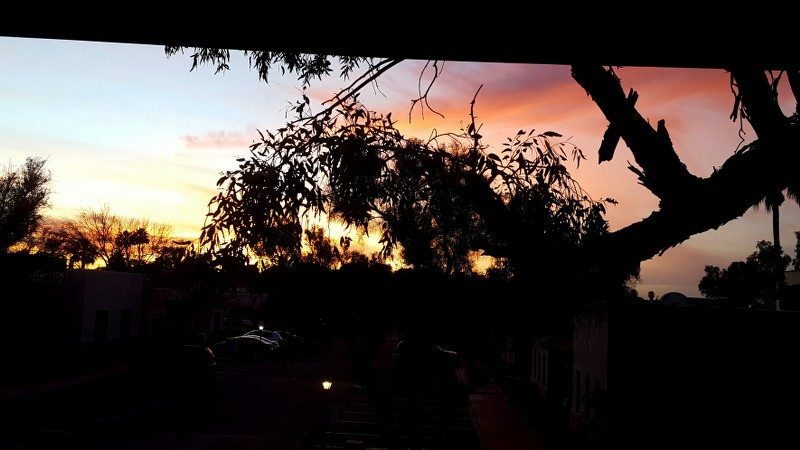 I’m going to offer my personal perspective on the selling side as well as the buying side. I hope this is useful. Post some comments and let me know. My reports are through my personal lens. Your mileage may vary. Make sure to check out the Graduates’ Galleries to see more of these artists’ great work! 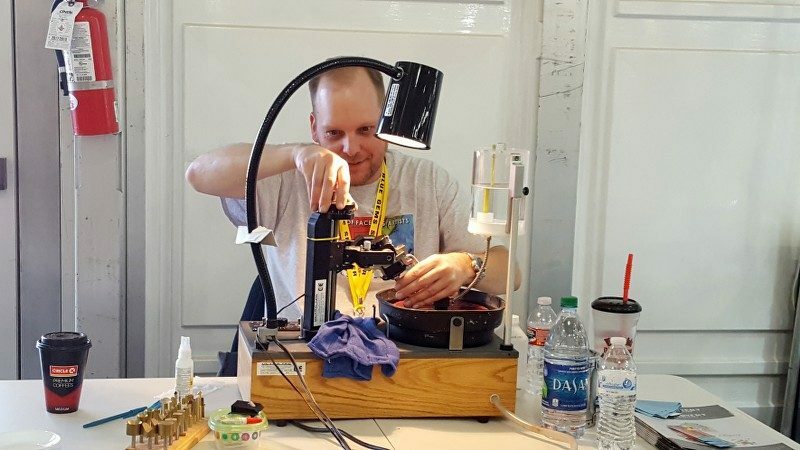 The AFA did both demonstration and commission faceting at our venue (the 22nd St show). 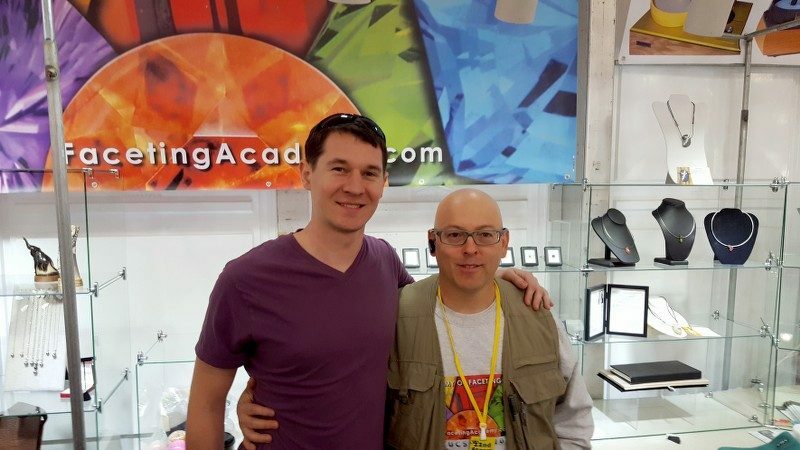 Justin Mynatt and Oke Millett did demos on Ultra Tec equipment and I did demos on both the Facetron and Ultra Tec. 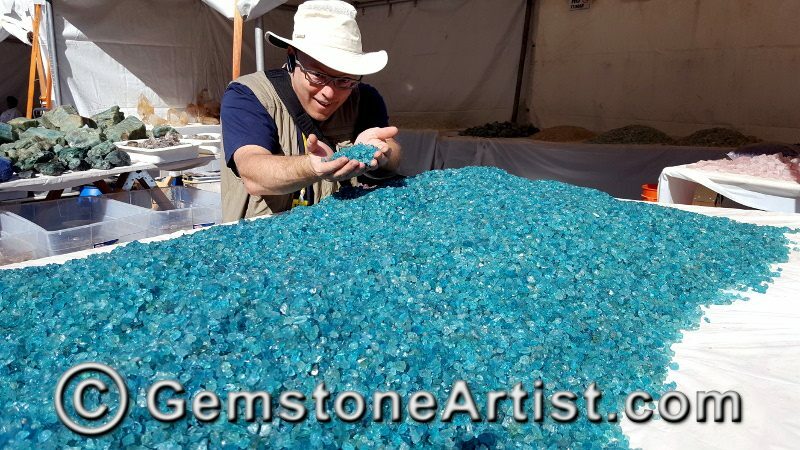 I think Oke sold most of his demonstration stones at the show. And, Justin smiled as he did commission work on-demand. While I was out sick for a couple of days, Ron packed my Facetron up so they could do demos with the Ultra Tec. 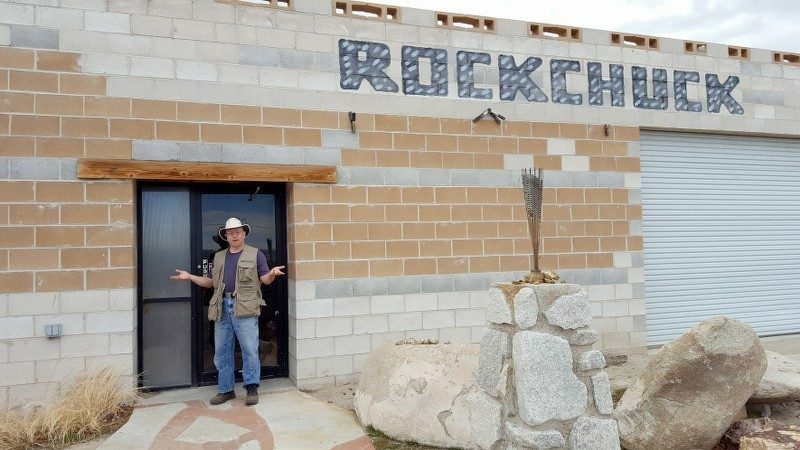 When I returned, I came back to a half-dozen pavilions ready to polish. Rather than breaking-down the UT machine and setting the Facetron back up, I just slid the Facetron dops into the Ultra Tec quill (HINT: They’ve got to be upside-down), found a witness facet and went to polishing. The next day, I transferred to Facetron dops, and set that instrument up to complete the crowns. If you’ve got good equipment, well-maintained, and work with care, this sort of thing isn’t a problem. It was actually fun to demonstrate! Though several of the gems I cut at the show have gone to new homes, here are a couple that are still available (as of this writing). 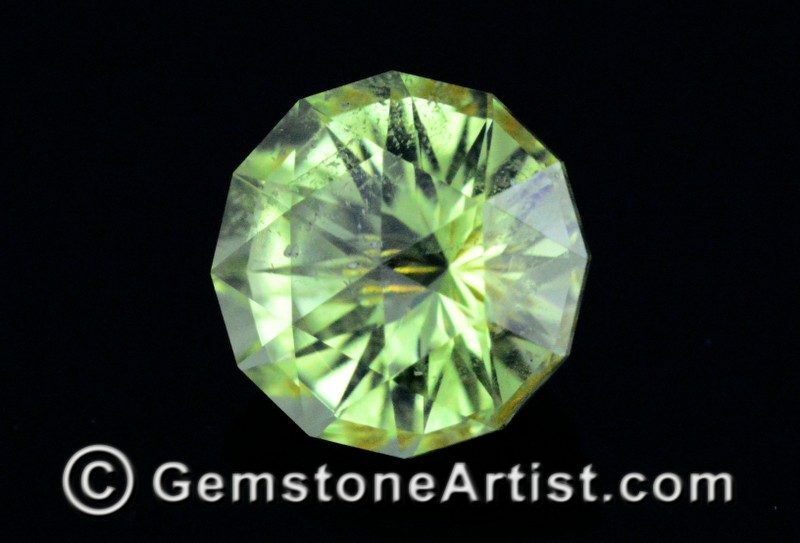 First a 1.65 ct, 6.9 mm Peridot from Pakistan. 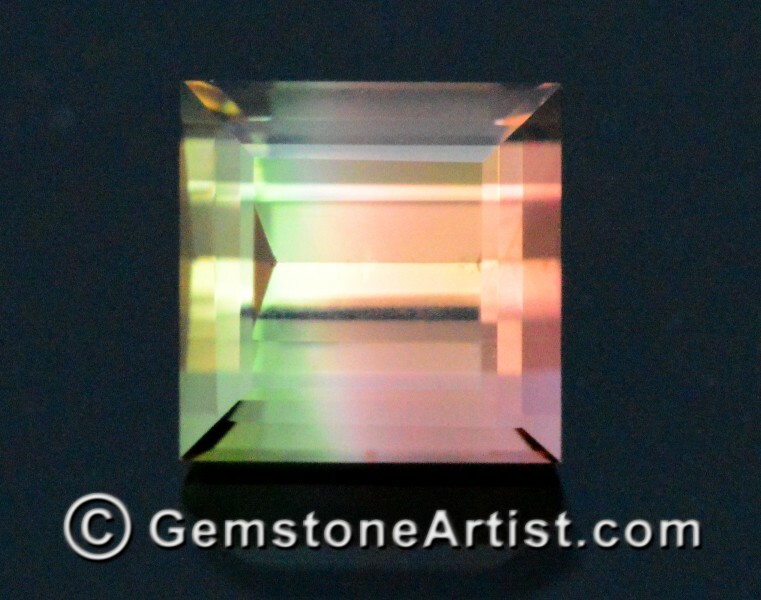 I created a design on-the-fly for this little guy to capture color and hide the inclusions. It was fun. 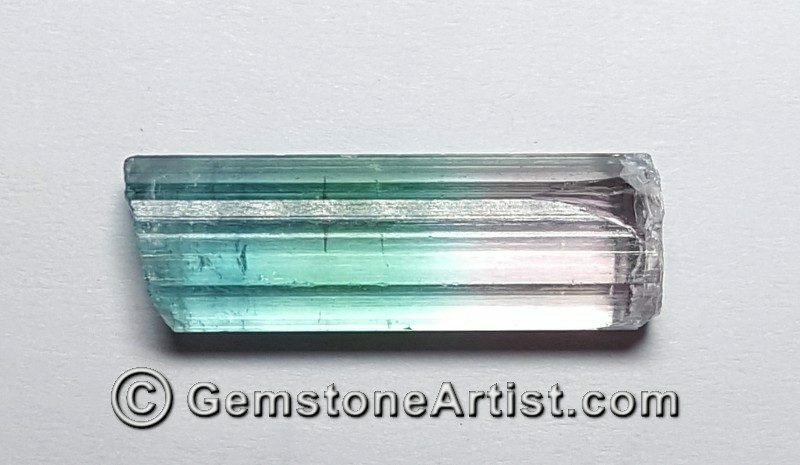 I bought this great little Tourmaline in a parcel early in the show, and just had to knock it out. 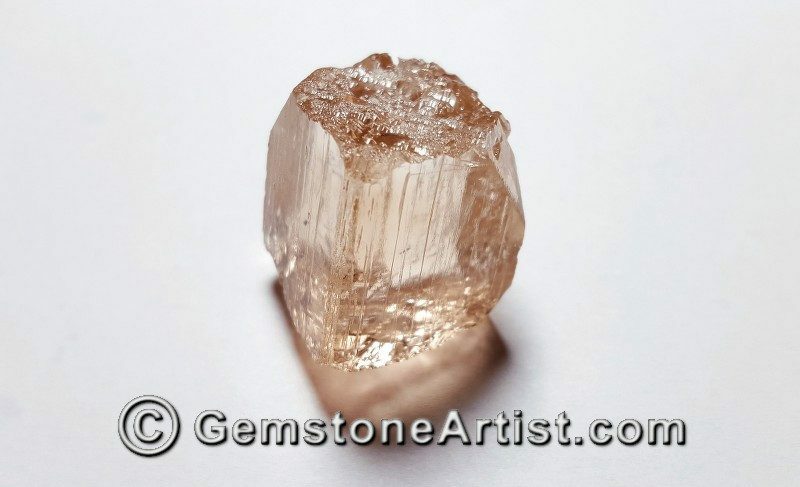 It’s 1.01 carats, and 12.7 x 2.7 mm. The mate to this one – and from the same parcel. 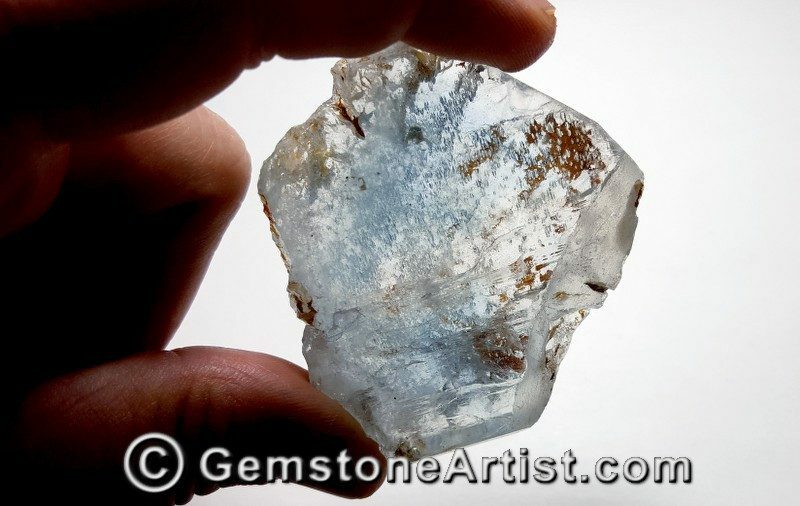 It comes in at 1.02 carats and 5.2 mm square. The C was ugly, so I did a demo of how to hide it. 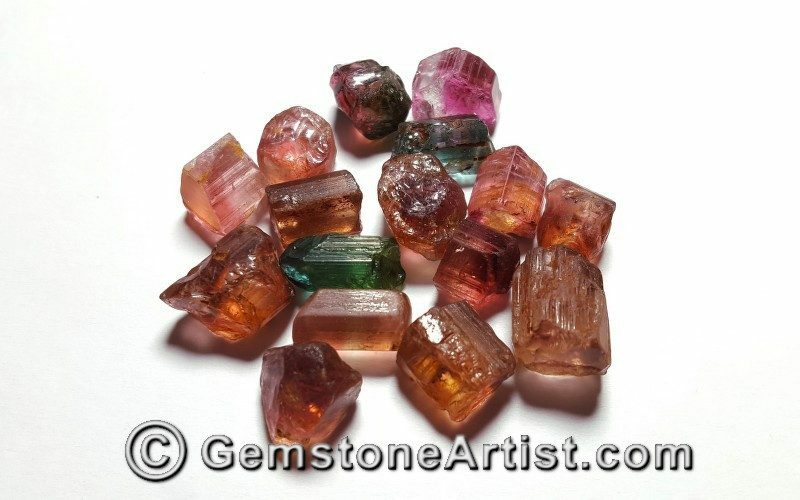 The gems on the right and left were cut from preforms identical to the one in the center. Here, they’re all on a white surface to show the white paper test that should have been done before buying. The other design, Gunter’s Glitter, is an aggressive reflector with a shallow checkerboard crown. With strong light, the reflector flashes nice color; in weaker light the crown throws back whatever you give it. 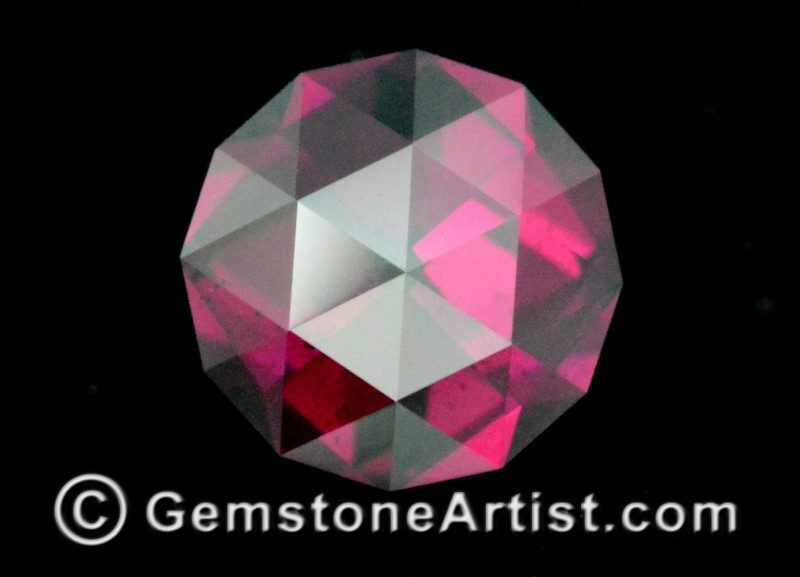 If you want to learn more about these sorts of techniques and exactly when and how to do them, come train with us at a Faceting Academy live event. 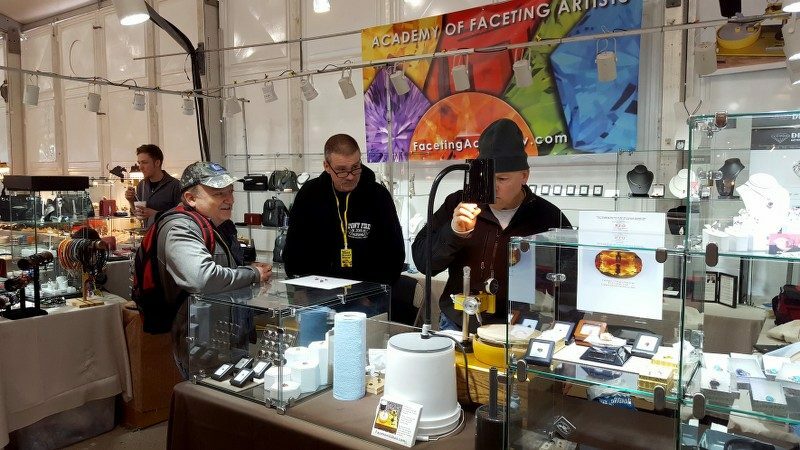 We had a really fantastic and international parade of visitors at the booth, from Academy graduates to fellow faceting artists and rough dealers from around the planet, to brand new Academy students we’re looking forward to training in our May event. 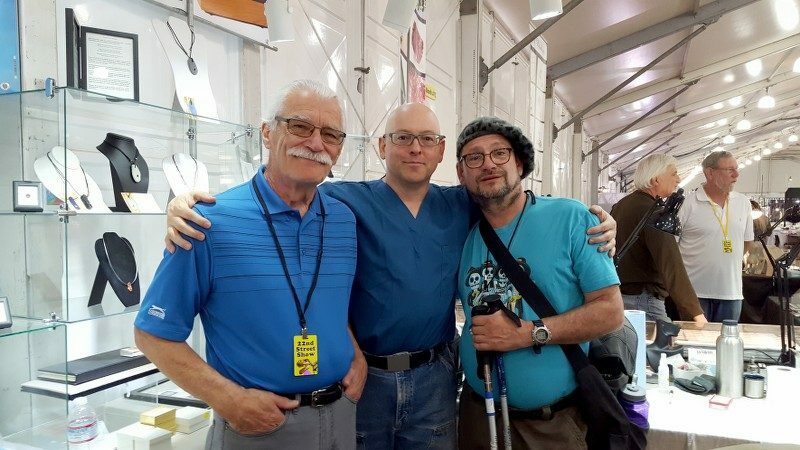 Soon after that, another Faceting Academy Graduate -and friend of 30+ years, Mark Stephan, came by for an all-too-short chat with Frank Umberger and myself. Academy Graduate Lloyd Addie dropped by to share some great rough he had acquired. 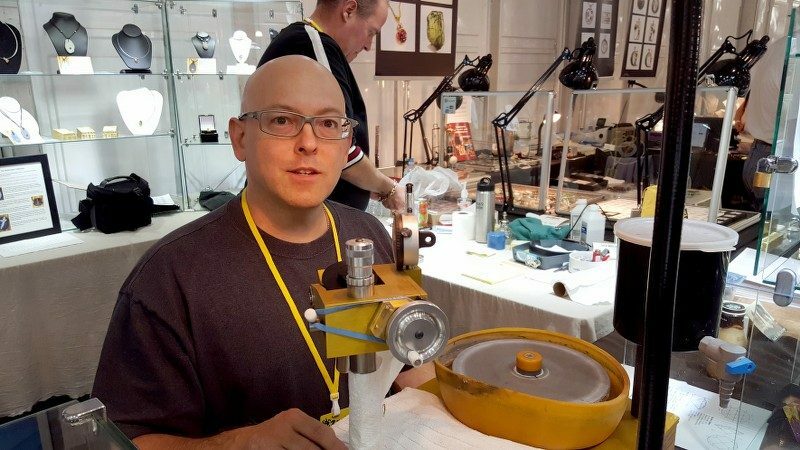 One of my favorite faceting artists, Derek Katzenbach, dropped by to talk shop and show me some incredible jewelry he was delivering to a client. Sure wish we’d had more time to visit. 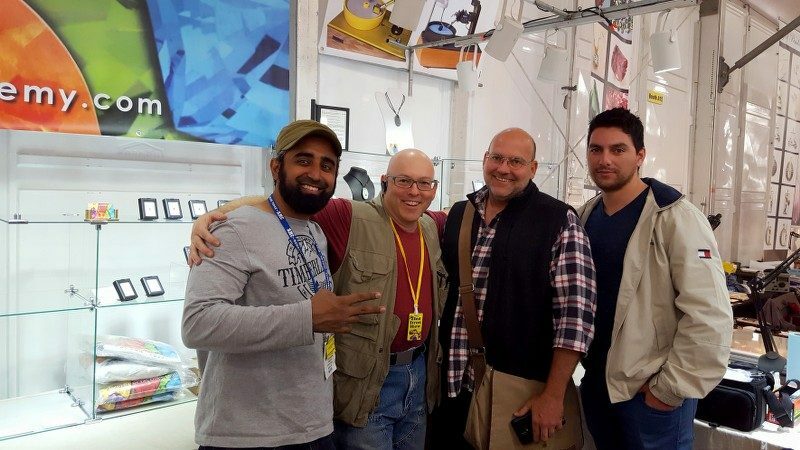 What a group this is: My friend of many years, Farooq Hashmi, of Intimate Gems; my friend Doug Menadue – great faceting artist of Bespoke Gems; and my new friend, Lucas Fassari – the world’s best gemstone inclusion photographer. 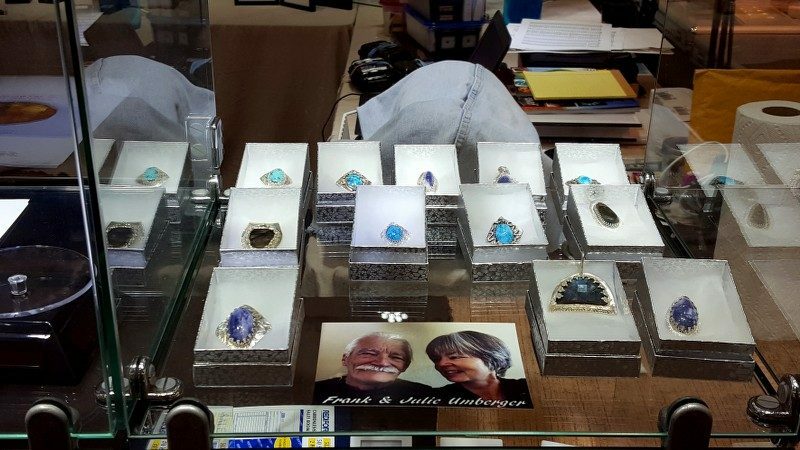 Jeweler and lapidary artist Richard Hart and gold artist Gabriella Borsay dropped by for a long-overdue in-person meeting. 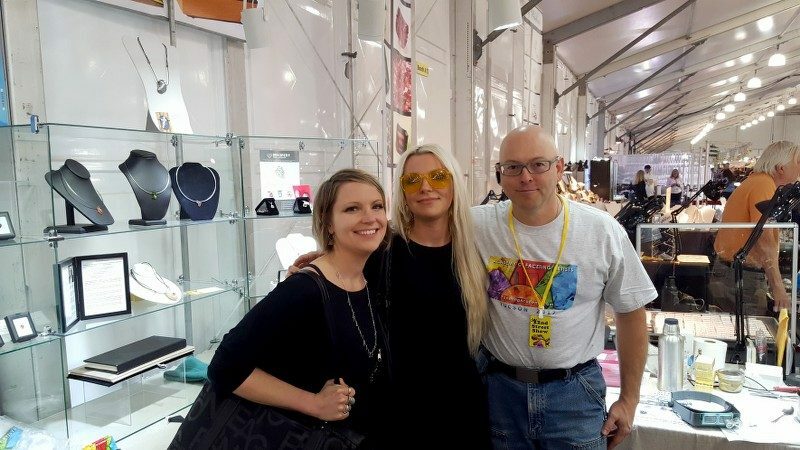 Faceting artist Januscz Meier and his wife Lucja, came from Alberta to spend some time talking polish. 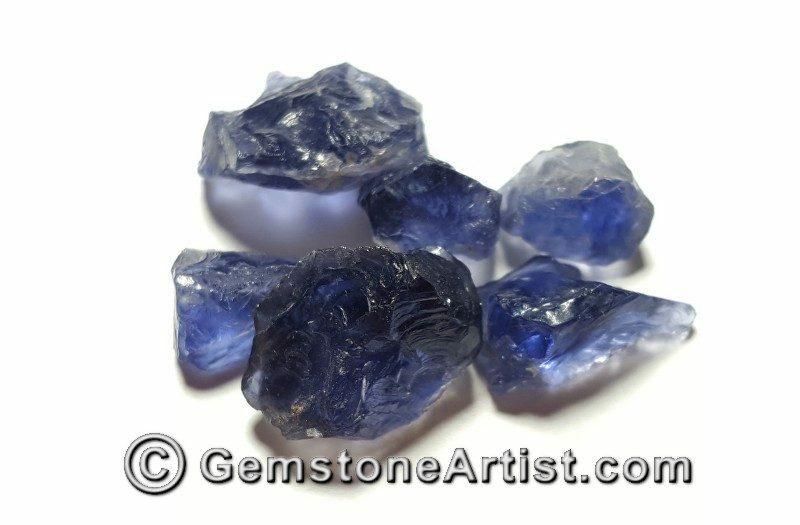 Javid paid us a visit, and brought some beautiful material (you’ll see below). 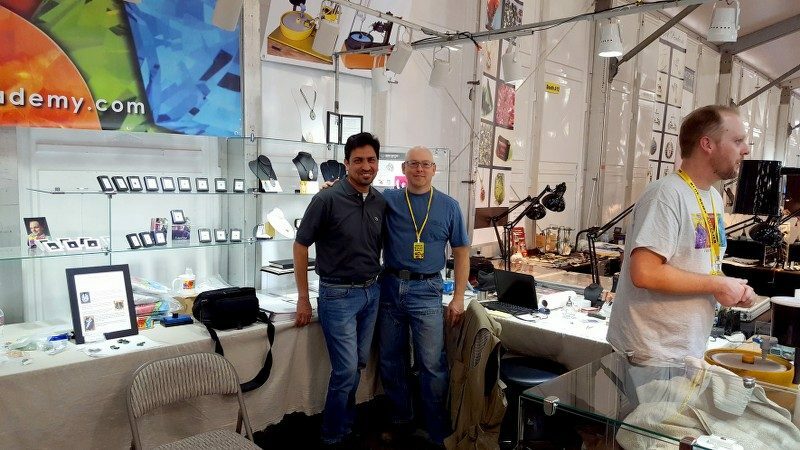 We were really happy to see Robert Mendoza from Ultra Tec. We always enjoy his great personal energy. 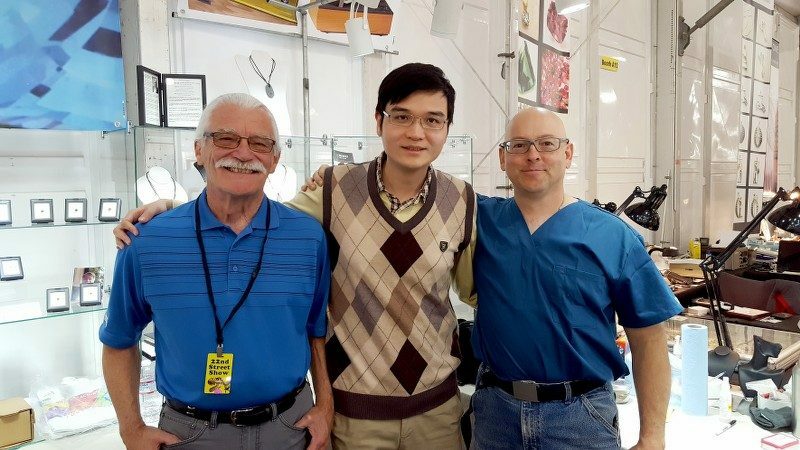 Our newest Faceting Academy student Kowei, spent time visiting, and sorting out logistics of his travel from Taiwan to attend our May event. We’re excited to have him in the class. 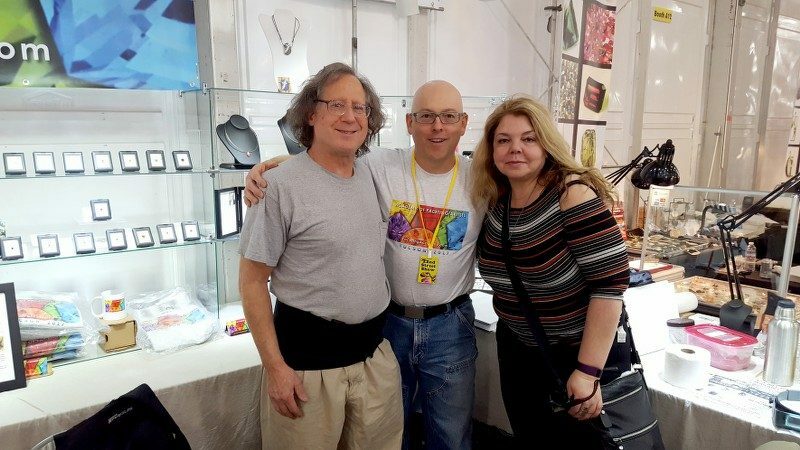 I did manage to get out of the booth a few times – to meet with the icon of the rough market, Steve Ulatowski, of New Era Gems. What a great conversation we had. I really enjoy his company and look forward to more. 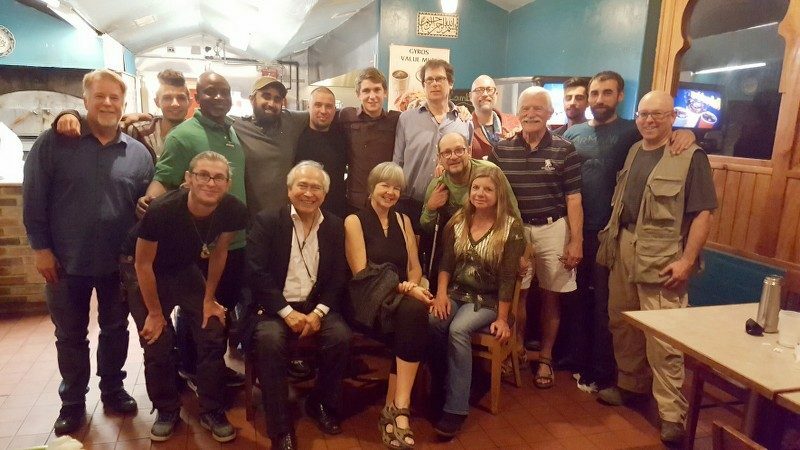 In all the time in Tucson, I managed ONE “night out” for a meal and visit with such a fantastic group of friends. Thanks to you all for being who you are. We had a great team on site, with plenty of hands on-deck most of the time. 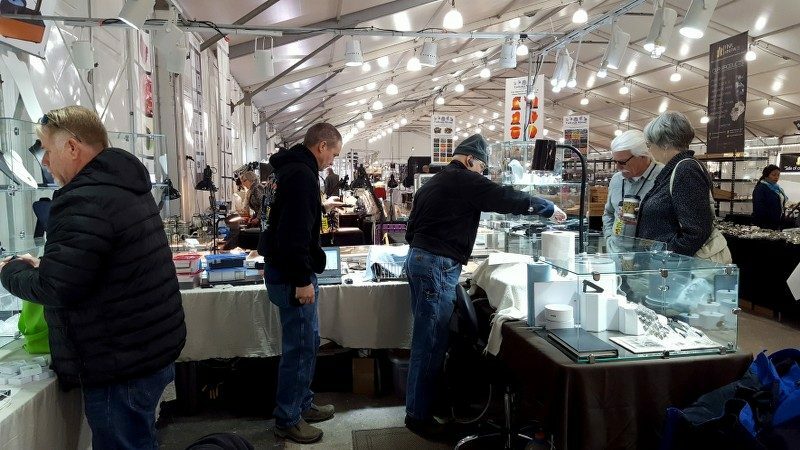 Here, Richard Vogl, Doug Robinson, myself, and Frank & Julie Umberger are setting up to welcome visitors to the 22nd St. Show. But, how were the sales? People who know what they want, and can afford it were buying. 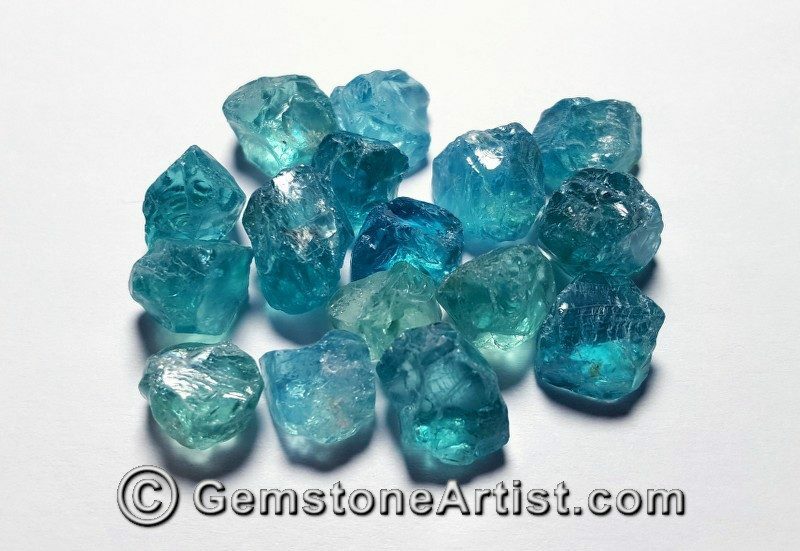 The serious gem and jewelry collector spent money to get quality goods. 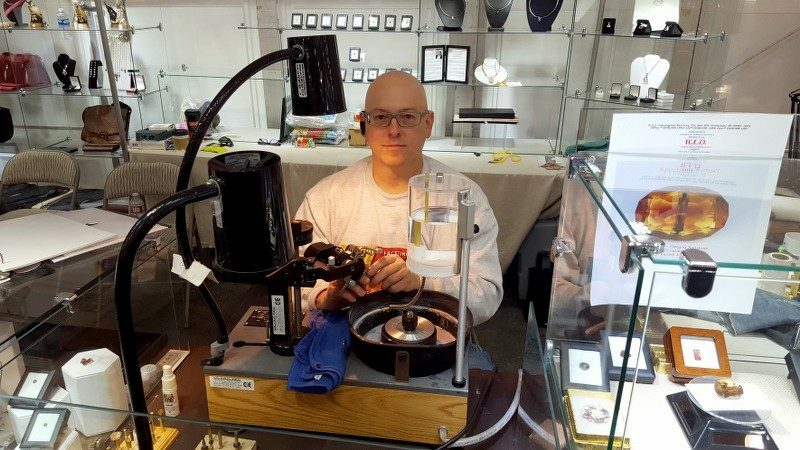 The professional jeweler bought for specific projects – and worked to build connections with artists they could meet – and whose skills they could review in person. 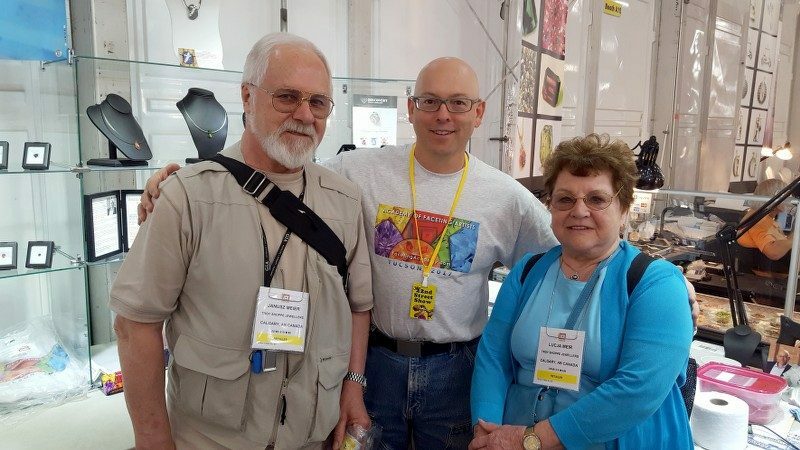 Member artists sold some nice pieces to customers who could appreciate jewelry art – and interacting with the artists. 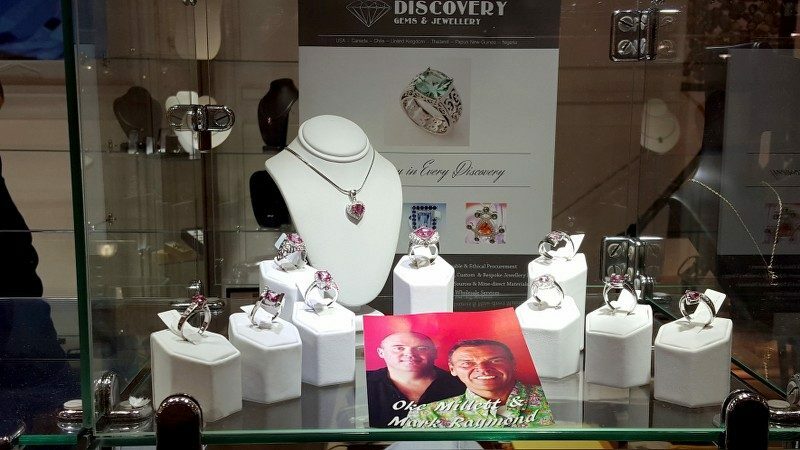 “Joe the plumber”, unless he was shopping for a specific engagement or anniversary gift, just enjoyed the sparkle. 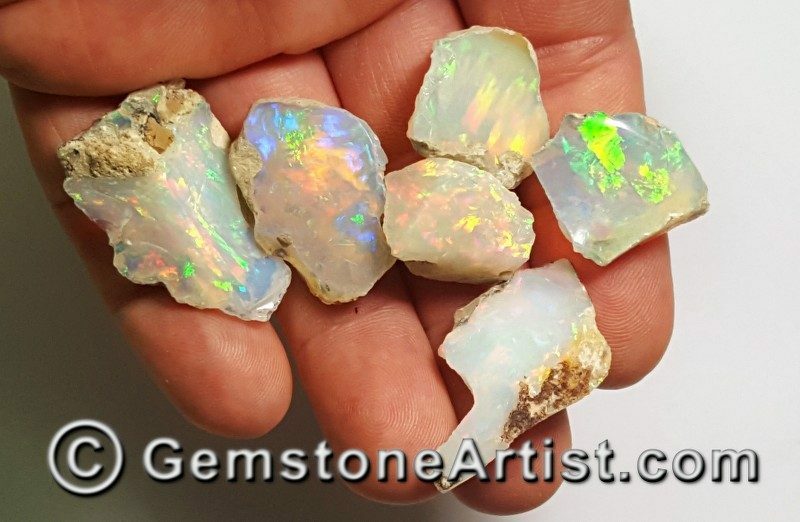 I think the retail jewelry market from the middle down, is going to be soft for a bit longer, until the everyday working person is more confident about the economy. 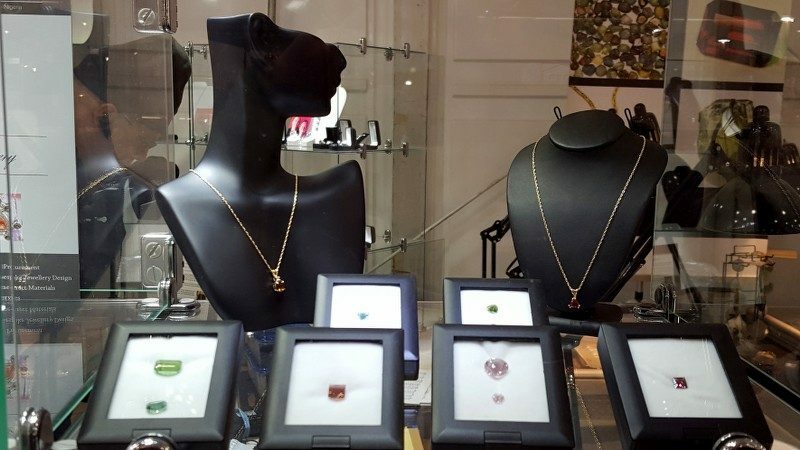 At this writing, the Stock Market is continuing to set new records, so there are indications a stronger mid-level jewelry market may bloom as the year progresses. The higher end is always solid, and perhaps getting stronger. Watch the Graduates’ Gallery for collections that speak to these trends! 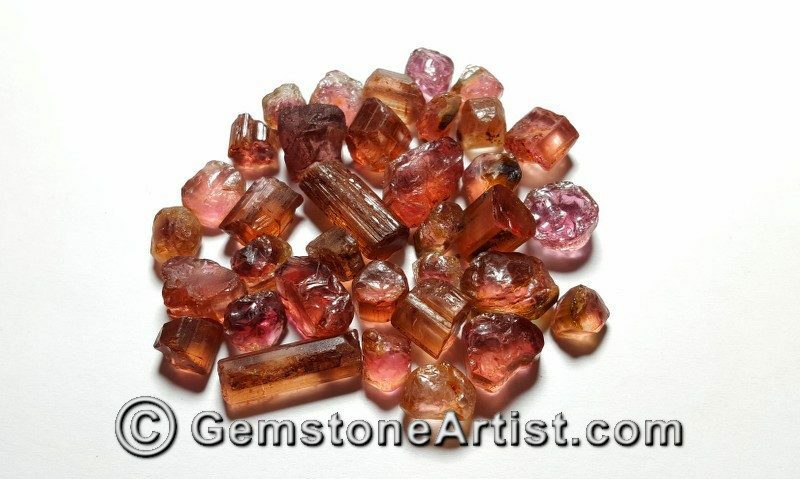 The Availability of rough in the market was, as always, up for some things and down for others. 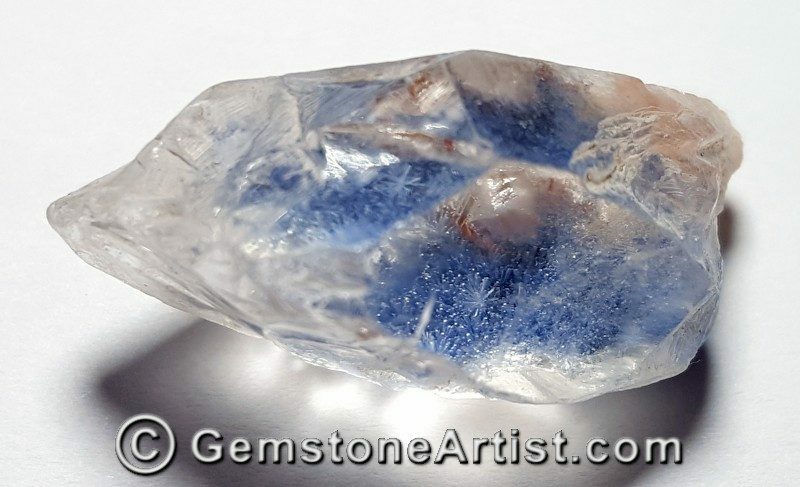 From Brazil, there was more Rutilated Quartz and Apatite than I’ve seen in a while. 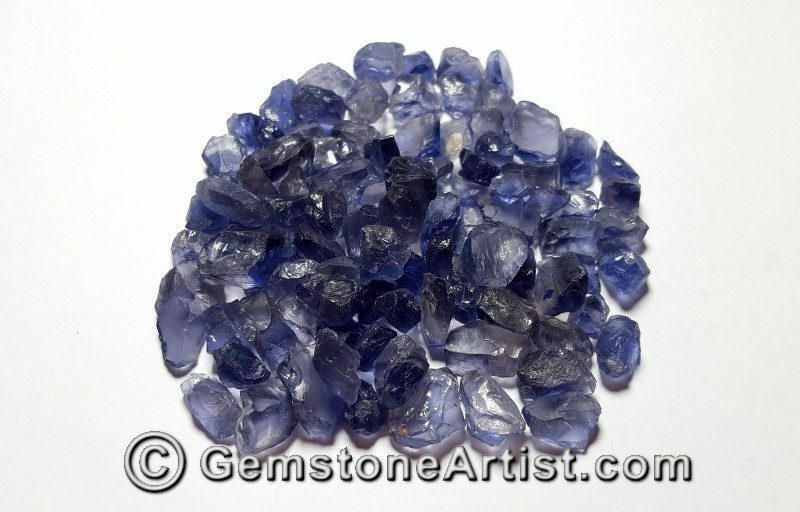 There was more – and better – Iolite than I’ve seen in a while. Other items were thin. The Prices seemed to reflect the economy. That is, they could be nutty. 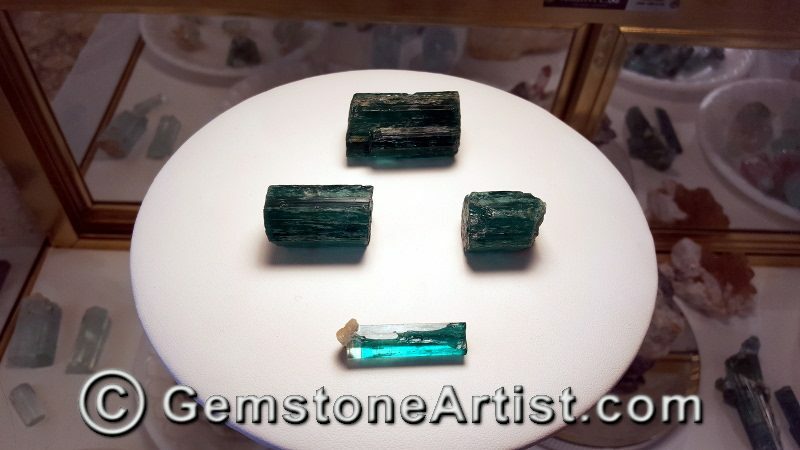 For instance, on Tourmaline, I found a couple of great deals, but also met poor middle-men who had bought during the Chinese bubble and failed to liquidate before it popped. They were stuck asking $180+ for goods that could be found in the market at $50. 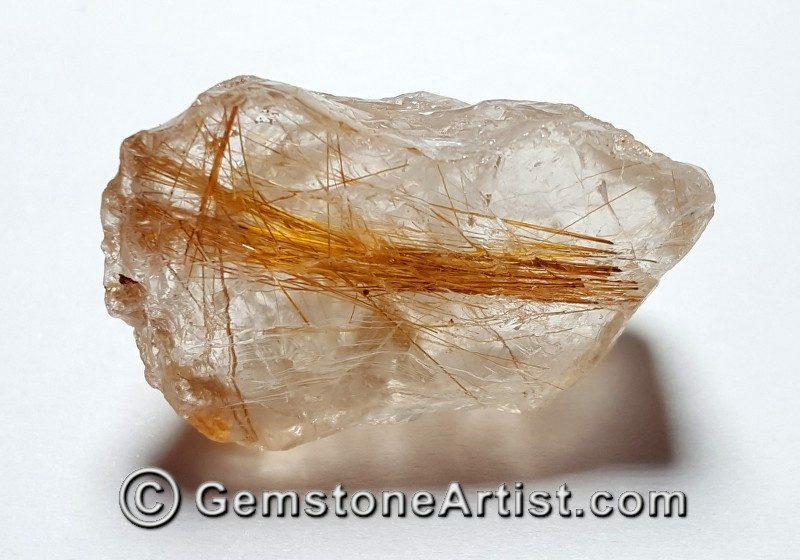 The person who sold this to me told me it is a lock of hair that a beautiful celtic sorceress took from her own head and preserved, frozen in crystal. I believe that story. 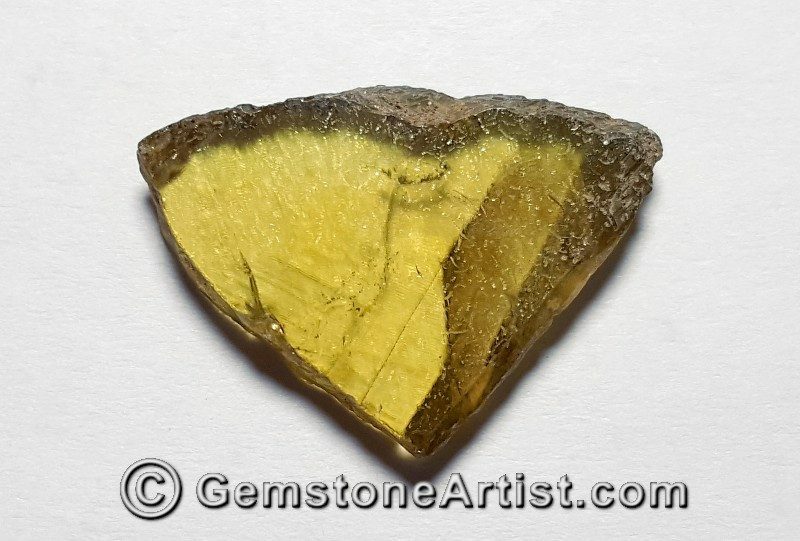 This nice Sphene gave me an idea for another special project. Can you see it? There was some nice Welo flash right in the 22nd St Show tent with us. I’ve had a project in mind for pieces just like this. Now, we’re set! 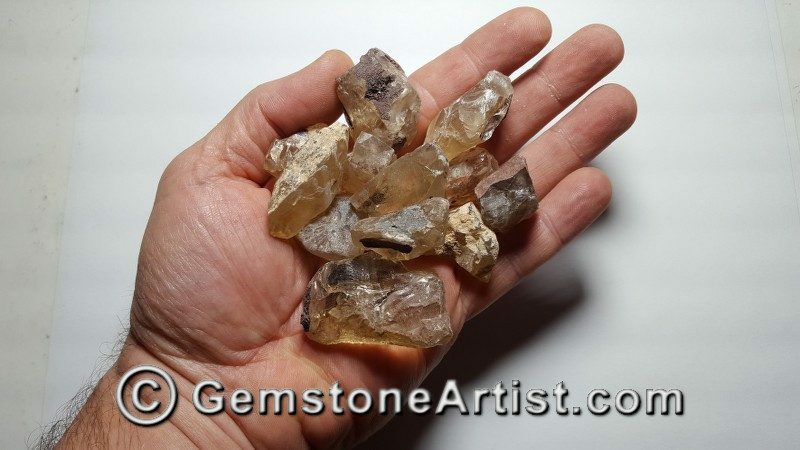 Some of the rest of the stones in that half-kilo parcel are going to be cut by Academy students this year. 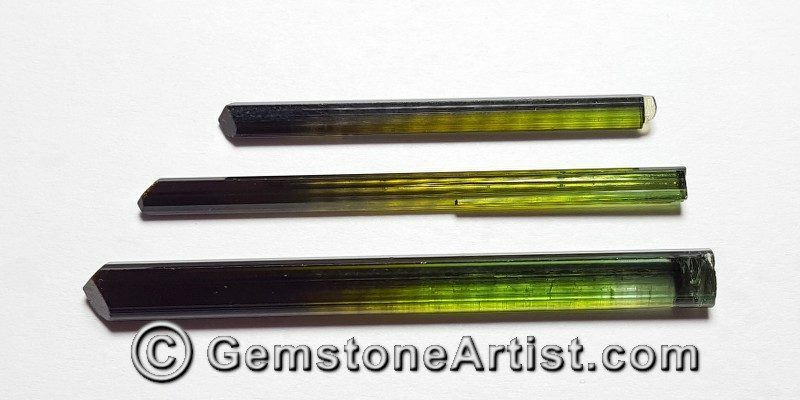 And, that’s the way it was … on my Tucson Tourmaline bender, 2017. 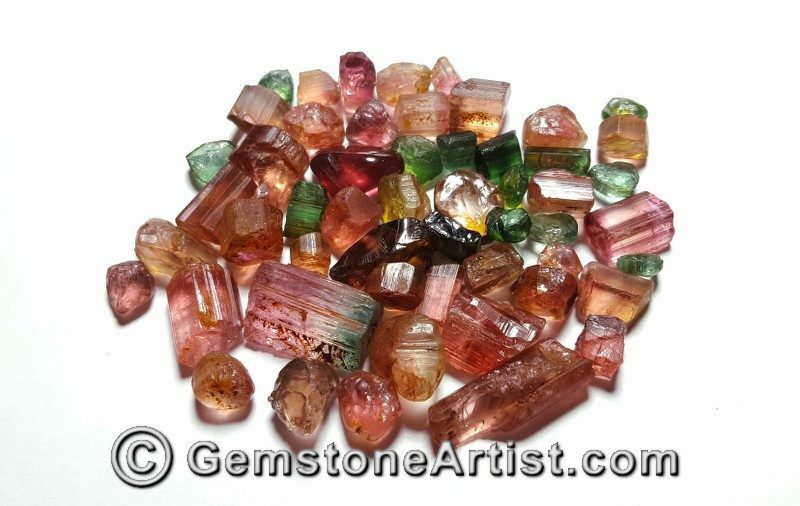 Keep an eye on the Gemstone Artist web site for photos of these same gemstones as they’re transformed into polished gems and finished jewelry. 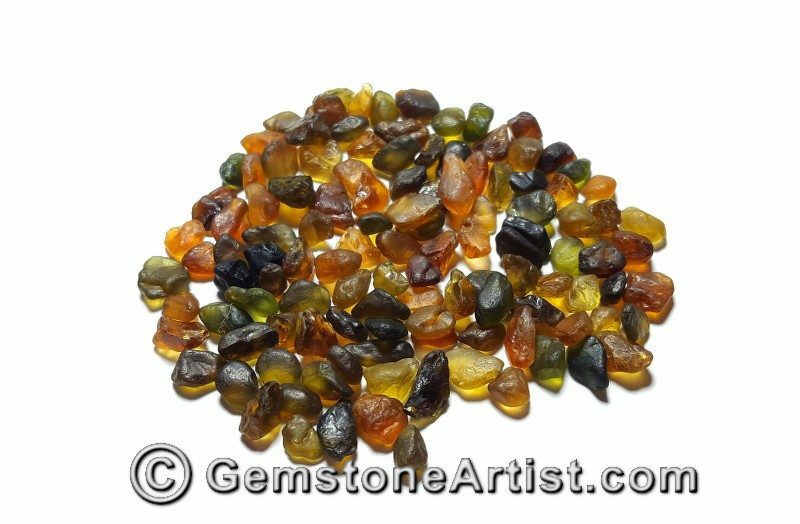 Keep an eye on this site and our newsletter to see some of these same gemstones after students cut them at the Academy events. 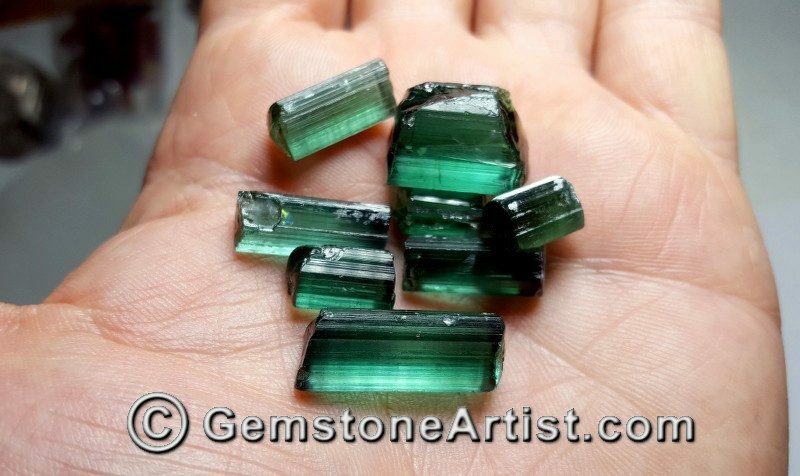 I’ll plead sick for neglecting to get photos of some things like some of the great new Emerald coming out of Ethiopia. I didn’t manage to acquire any of it, but I’d say watch the market. 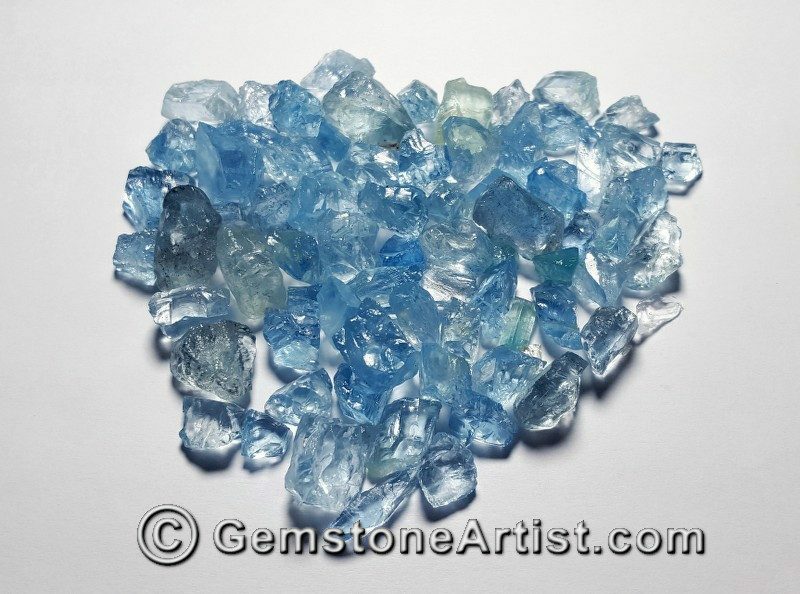 The production sounds like it’s going to be strong – and the quality is looking impressive. 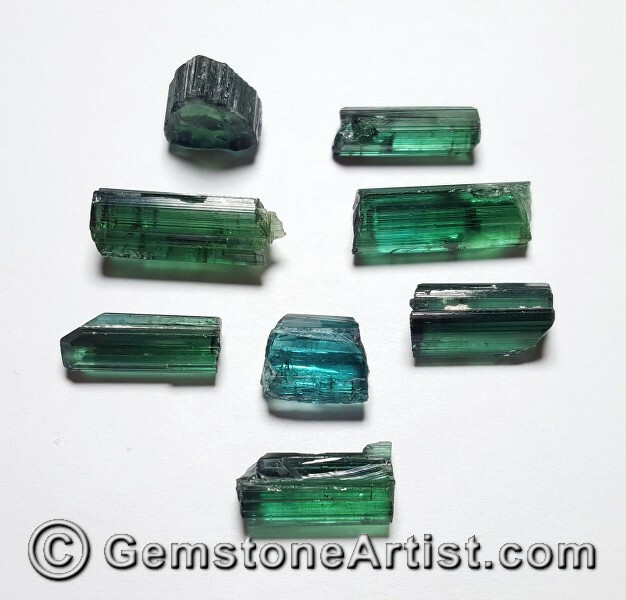 We’re going to see some pretty Emerald – and from what I’m hearing, lots more stuff, from that country, soon. Again, I’ll plead sick for neglecting to get a photo. A description will have to do. 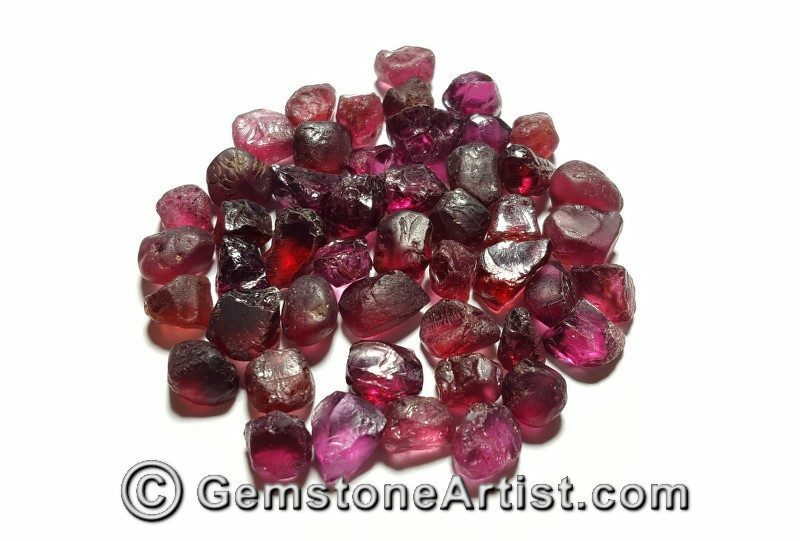 A rough dealer I know showed me a Ruby crystal and told me he paid too little for it; asked me what was wrong with it. 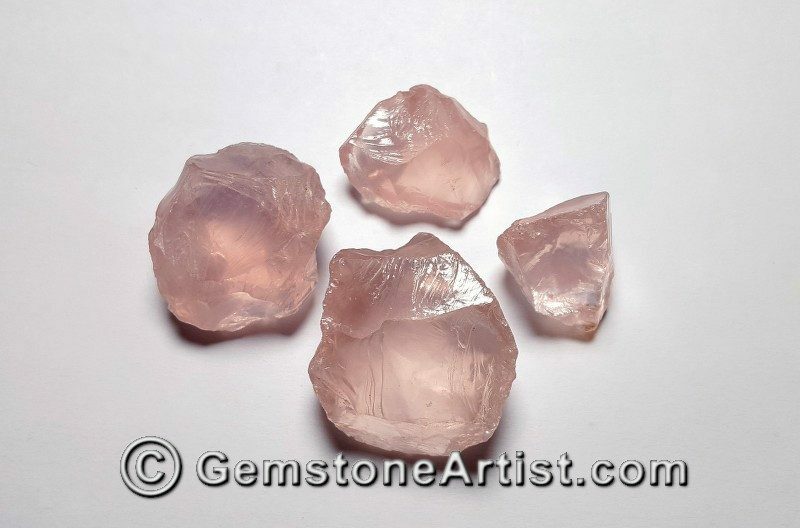 Cursory examination looked like standard hexagonal-habit Ruby. The faces were rough, the clarity was pretty nice, and good color. Examination under a 10x loupe disclosed the spherical gas bubble signature of glass-filling. Close study showed a couple of divots on the surface where the usual “candy coating” hadn’t been sanded away – perhaps on a sidewalk. Whoever sold it to the dealer had taken a standard glass-filled stone and knocked the shiny surface off to make it less obvious. 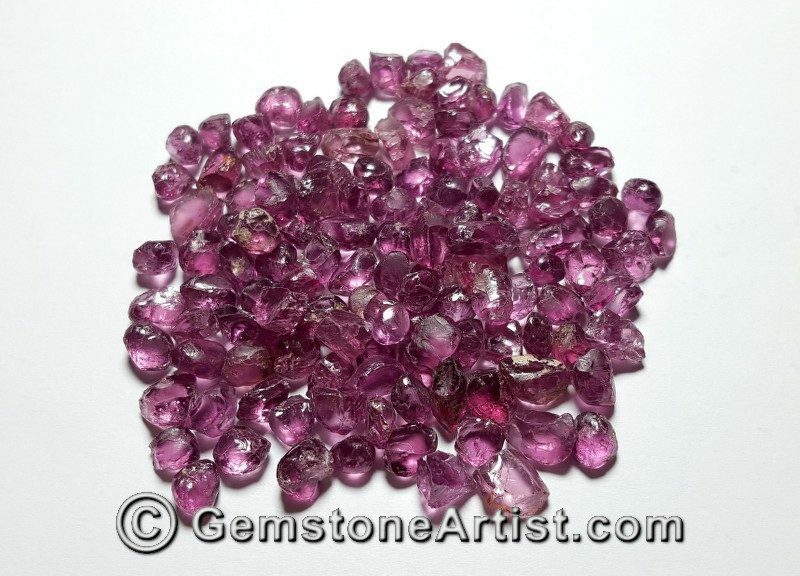 Remember that glass-filling is really common – and in every color of corundum, now. 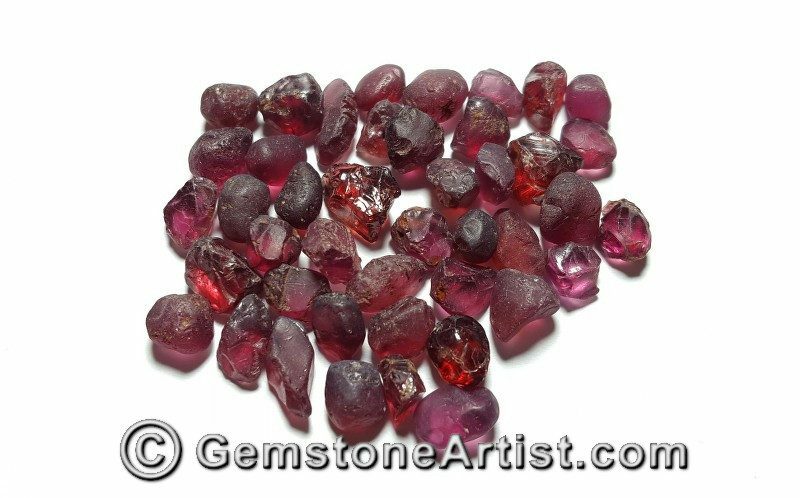 Have a look at a presentation I did back in 2009 for the CWFG, which includes material on glass-filled corundum. 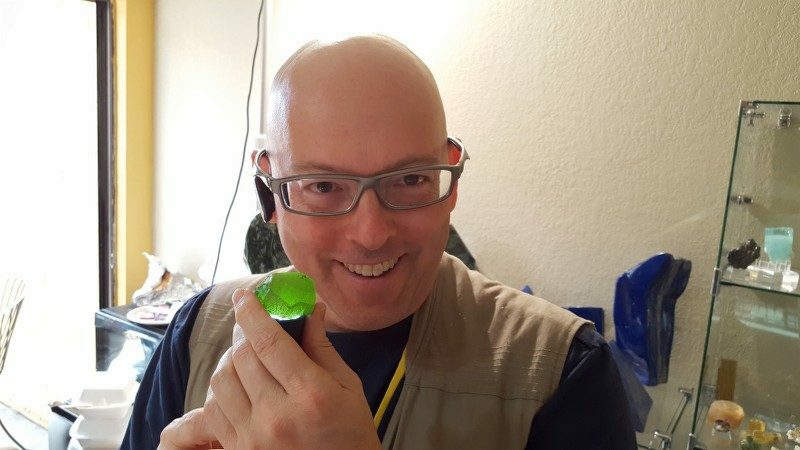 I got to see and hold a wonderful, top-color and top-clarity Emerald crystal from Panjshir, Afghanistan. It’s about the size of my little finger. The asking price was $60,000. 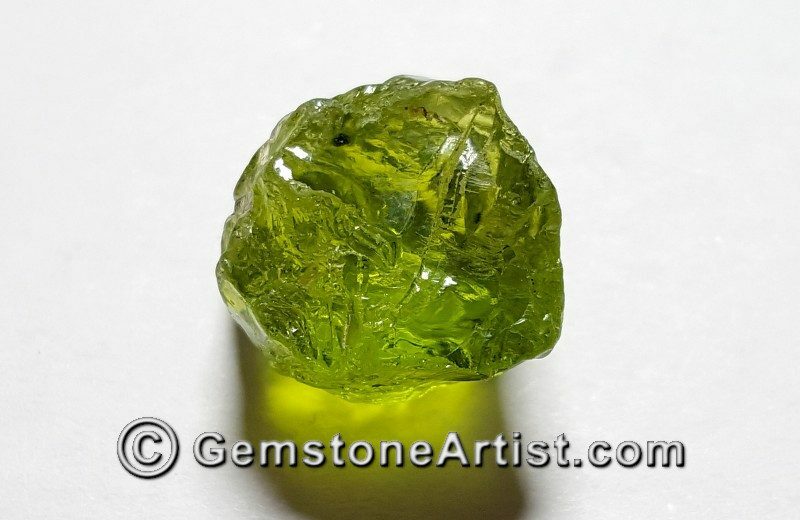 And, there was this great chunk of Peridot from Pakistan. I think it was 60-something grams. Unfortunately, it had some issues that would have required breaking it into pieces. Otherwise, I would have had to buy it. 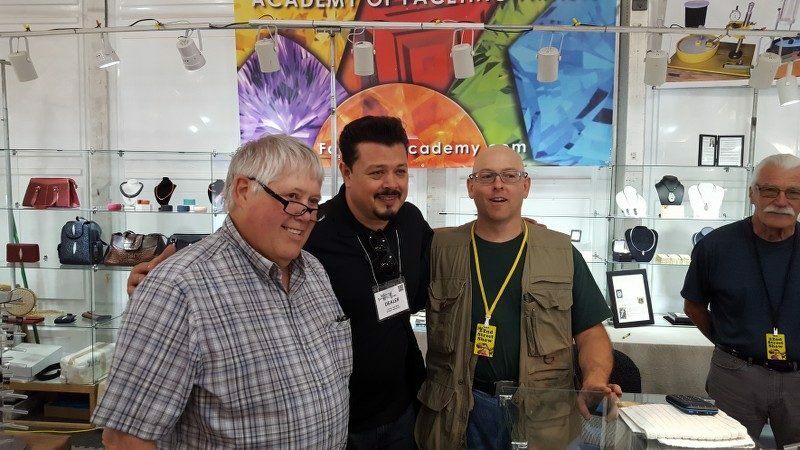 Besides special thanks to my close friend Ron Skog – and to all the members of the Academy of Faceting Artists – and the other artists who visited with us, I want to express specific gratitude to rough dealers who helped source material for students of Faceting Academy students to train on. 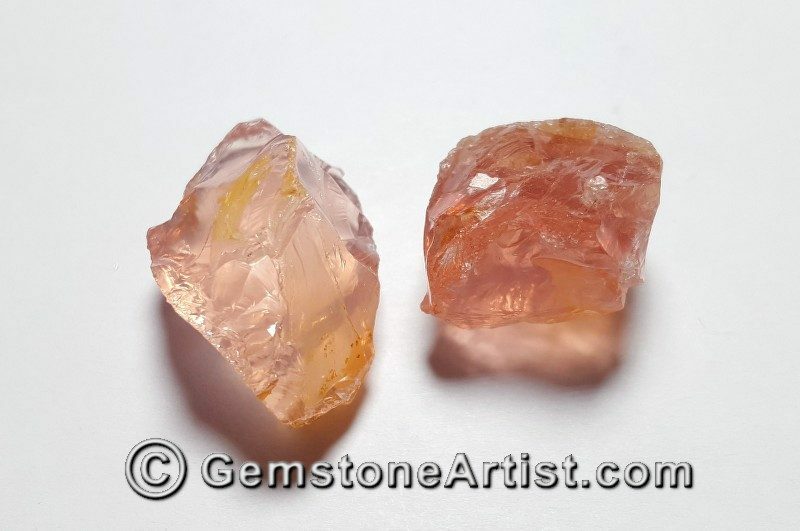 Nirinjan Khalsa, of Suncrystal Mining, helped source some Oregon Sunstone rough that fit our very specific training needs. Thanks again to all the rough dealers who helped us find special training materials, who provided us great deals on training materials – or who even donated roughs to help us deliver the highest-quality and most complete training possible for our students. 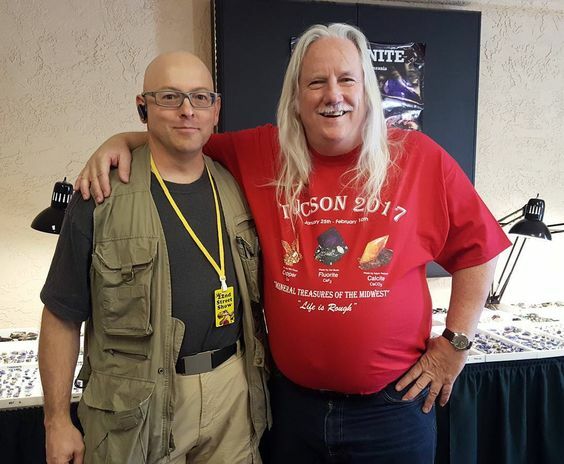 Expect us: The Academy of Faceting Artists is currently in planning for Tucson 2018. And, we might just drop by – even when you aren’t home, Chelsea. 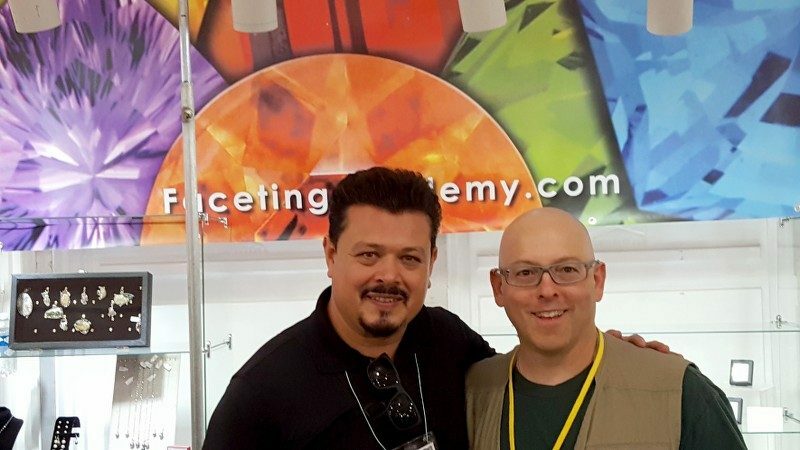 Expect more of us: The Faceting Academy is currently training faceting artists and coaching existing faceting artists to improve every part of their game. Expect more collections: The Academy is facilitating new and exciting work by its members. The membership is synergistically sourcing, designing, and creating. Look for some interesting new things. Until then, watch us on Pinterest, Twitter, Instagram – and our own dedicated newsletter (sign up at the top of our home page). 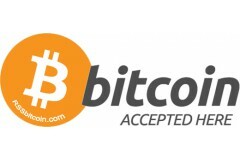 We don't sell or share your e-mail.